Serve this delightful vegetable dish with brown rice and grilled marinated salmon. 1. In large skillet or wok, heat oil over medium-high heat. 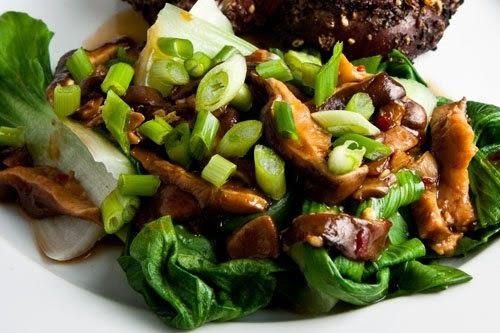 Add mushrooms, shallots and garlic and stir-fry until mushrooms darken, about 5 minutes. 2. Add bok choy and stir-fry for about 8-10 minutes until tender. Sprinkle with soy sauce, lemon zest and salt and pepper, to taste. Serve.